What is believed to be the first significant installation of Thorn Identification, Visibility and Safety lighting, or IVS, is in Cadriano, near Bologna. Here the Municipality, mindful that one in four pedestrian deaths occur on supposedly 'safe' crossings, is increasing efforts to make pedestrian crossings safer, especially for the disabled and elderly who may need more time to cross the road. The new installation comprises a mixture of dedicated Civic IVS lanterns with 140W ceramic metal halide lamps and column mounted LED signals. "There is no obligation to adopt it," explains Thorn sales manager, Stefano De Leo, "but this new frontier in road safety is beginning to assert itself". Researchers with EuroTest recently studied 215 crossings and found that nearly one in five scored badly for night visibility. 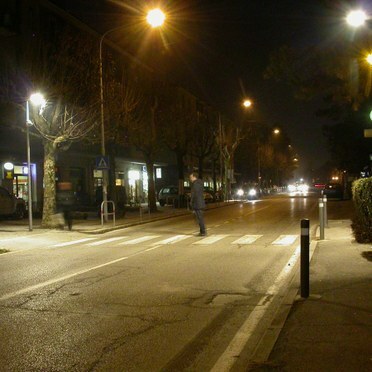 Cadriano joins a growing number of towns and cities around the country, including Como, Varese, Florence and Prato, with IVS lighting systems that improve pedestrian safety at zebra crossings.